The Tuesday starts with the opening of a new topic “From genes to ecosystems: Effects of global change”. Keynote speaker is professor Filip Volckaert from Belgien, who talks about intraspecific biodiversity on a genetic level. Three years ago, I would have been lost at the first slide, but after having spent time hanging over the shoulder of my collegue Angelica Ardehed, who is the geneticist that extracts the DNA from all the seaweed i pull out of the water, I can follow the entire lecture. Thank you Angelica! This was a really good keynote for the topic. Filip Volckaert lays the field for todays speakers really well, by going through the basics of genetics. This will save me some time, since I will have my presentation in this topic at the end of the day. Excellent! During the following discussion concerning the need of biologists to also take courses in policy making, law and economics, Volckaert says “I live in Belgium, yes, but Brussels is abroad for me. I send postcards home when I go there.” A comment in true Groucho Marx-style. First out of the presentations is Mike Elliot from University of Hull, who summarizes ”Conceptual models of the consequences of global climate change for estuaries and seas”. He kindly warns us that he will make our Brains explode with the amount of “horrendograms” he is about to show us. 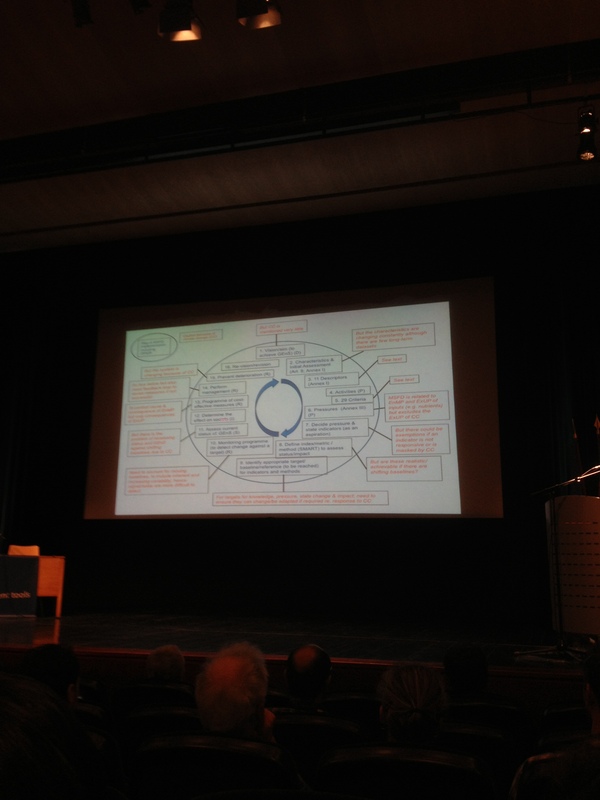 I myself rather like conceptual models, but there is such a thing as too much of a good thing. We do, luckily survive, however. Many of the models are really good, but a Little colour never goes amiss. It is a brilliant summary of what needs to be done to achieve the EU’s marine framework directive. Mike ends by showing a slide of the ”to do”-list. I just wish politicians would understand how much work this will require. 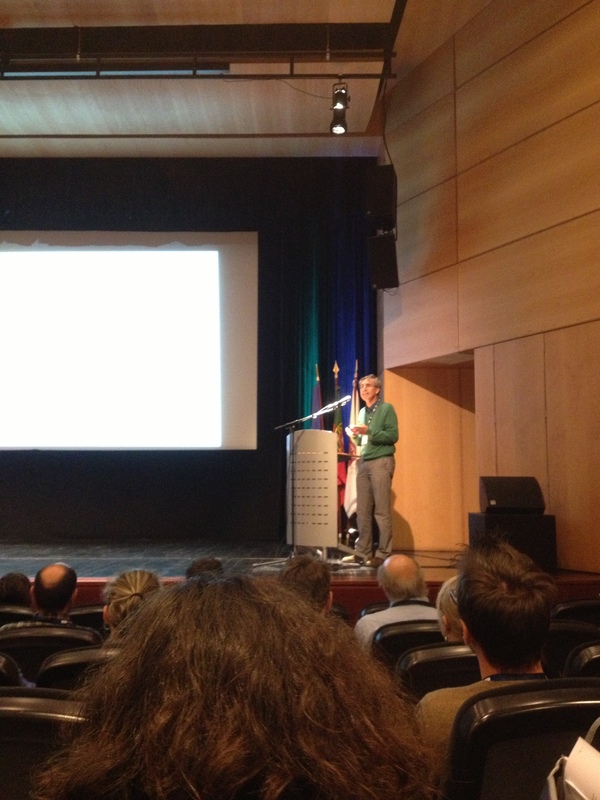 Guillem Chust from Spanin follows with ”Vulnerability of estuarine species and communities under climate change”. He has inverstigated how a warmer climate might affect the distribution of the seagrass Zostera noltii along the Basque coast by coupling hydromorphological models with species distribution models. He presents how the seagrass’ distribution would change at two different scenarios, elevated temperature and elevated sea level, with reductions of biomass between 20-40 %.He also shows a neat setup where they are trying to recreate a seagrass bed by putting out boxes of sediment in which they have already planted Zostera noltii. I’m rather tempted to try that at home at the Askö laboratory, just for fun, with our Zostera marina. Next presenter is an old friend from Tjärnö, Greg Charrier. He has been ther for five years, and we met at a CeMEB course where he was teaching genetic methods. Small world. Greg, who is now safely back in France, presents ”Integrative approach on the responses of a coastal fish to global warming”. They have worked with flounder (Platichthys flesus) which has turned out to be a good indicator for water quality and stress, along the French, Spanich and Portugese Atlantic coast. Using common garden experiments, they checked if the Southern populations, at the edge of its distribution, are more tolerant to warmer temperatures (heat stress) that the others. They have also tested the sensitivity to other chemicals (chemical stress) and low oxygen levels (hypoxic stress). Stress is measured by comparing the growth rate of small stressed flounders to non-stressed, and also by measuring different metabolic processes. The research of Morgana Tagliarolo from Rhodes University focuses on what mechanisms Controls the distribution of the two bivalves Perna perna and Mytilus galloprovincialis (a relative to our blue mussel Mytilus edulis) outside the Namibian and South African Coast. Perna perna is the native mussel, and Mytilus galloprovincialis has arrived later and is considered invasive. Morgana has tested if they differ in metabolism, which means looking at who grows fastest and can thus compete better for space, and also if the metabolism differs at different temperatures. The South African coast is tidal, wich means that the mussels are pup in the air at low tide. Therefor they have measured both in water and in air, to get a true image of the mussels life. It is important that studies should have ecological relevans, something not everyone always remembers. After coffee (mini-lunch) with a small cup of coffee a la Black Death, we take our seats again to listen to Adriana Verges talk on ”Climate-driven shifts in herbivory and the disapperance of kelp forrests in eastern Australia”. She focuses on what will happen when the herbivorous fish that keep the coral reefs in the tropical Waters clean from algae, moves into temperate Waters due to rising sea temperatures. On the coral reefs, the fish are the key to keeping the reef algae- free, so that the corals aren’t shaded or suffocated. But in temperate Waters, algae are the foundation species, providing the shelter as trees in the marine forrest. And they cannot withstand the intense grazing by the coral reef fishes. Inventories of the kelp forrests along Eastern Australia show that the kelp has been reduces since 2002. In some localities it’s been grazed to a barren. Adriana shows some film clips of where they hade put out kelp and filmed how soon fish and sea urchins, two notorius kelp eaters, finds and consumes the kelp.The research is part of a cooperation with amongs others Japan, who have the same problems. B Duarte continues along the same line but up on land with ” The impact of extreme temperature events on halophytic vegetation”. Being halophytic means that you, as a plant, are able to grow in salty environments, and that in some cases even grow better there. The Camargue delta in southern France, for example is a very good place for halophytes. These plants have to cope with growing submerged from time to time, which may cause low or no access to oxygen for the roots, sometimes there are periods of drought. A tough life. The results show that halophytes are generally not significantly affected by colder periods, but that extreme periods of heat causes a great loss of energy for this group of plants. We return bavk into the sea and the macroalgae with the presentation of I Rodil, ”Effects of global climate change factors on macroalgae subsides and consequent impacts on sandy beach consumers” which shows that the sandy beaches are not the marine deserts as previously thought, because they are supplied with macroalgae from adjacent hard bottoms, allowing for a richer fauna. If the nutrient content of macroalgae would be negatively affected by climate change, this will in turn affect the faunal assemblage of the sandy shores. But how? Exciting research on Laminaria ochroleuca and Sargassum muticum follows, and is then connected to the sandy shore animals. A fun study in several steps to ensure the overall system is covered and links two different habitats. It is always wonderful to see the beautiful images of marine organisms. The BalticSeaWeed blog is generally positive to algae, but there are times when they are not wanted. Aschwin Engelen does research on corals along the coast of Portugal and presents his group’s research “Temperate gorgonians during invasive seaweed proliferation and acidification preassure,” which shows how invasive algae are smothering coral. Most prominent is the invasive alga Asparagopsis armata . But corals are also grappling with problems with infections due to hot water and mechanical damage from fishing lines. To really get a clear picture of what affects corals, they have also mapped all the microbes on corals (microbiome) by genetic sequencing. Apparently, many coral species have unique microbes that they do not share with other, closely related , coral species. By exposing corals to different algae by allowing water from an algae to pass over the coral, they could see how microbes respond to the seaweed chemical signal by moving away. This could cause a lowering of the coral’s defense against epiphytes, which would allow the algae to attach to the coral. Exciting! 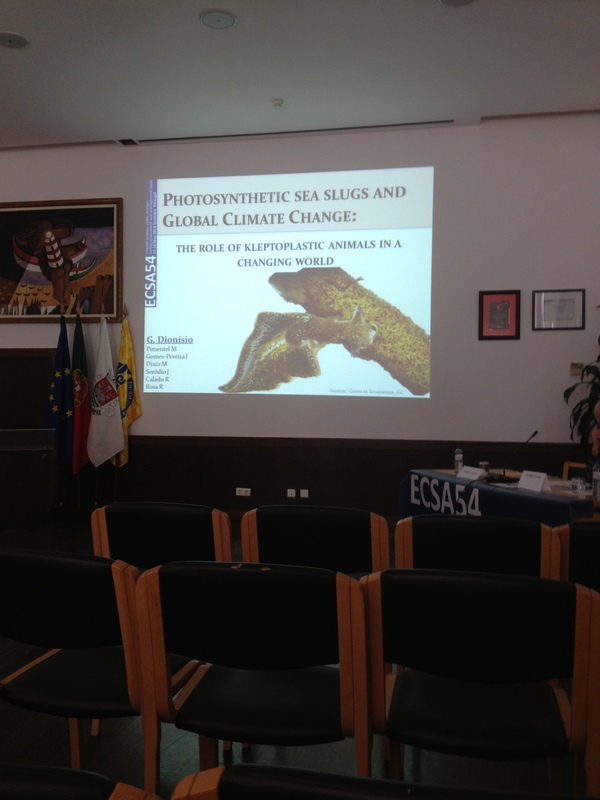 After a long lunch with a dip in the refreshing Atlantic Waves (16 degrees is not bad), we returned to the Conference to listen to the presentation with the best title: ”Photosynthetic sea slugs and global climate change: The role of kleptoplasty in a changing world”. Giselle Dionisio works with the wonderful Little green velvet sea slug Elysia viridis and has tested how the chloroplast that they take from the algae they feed on, survives at high temperatures. Cleptoplasty (stolen chloroplasts) is very complex and suprisingly Little is known about it, so it was a very interesting talk, and we had a great chat afterwards. 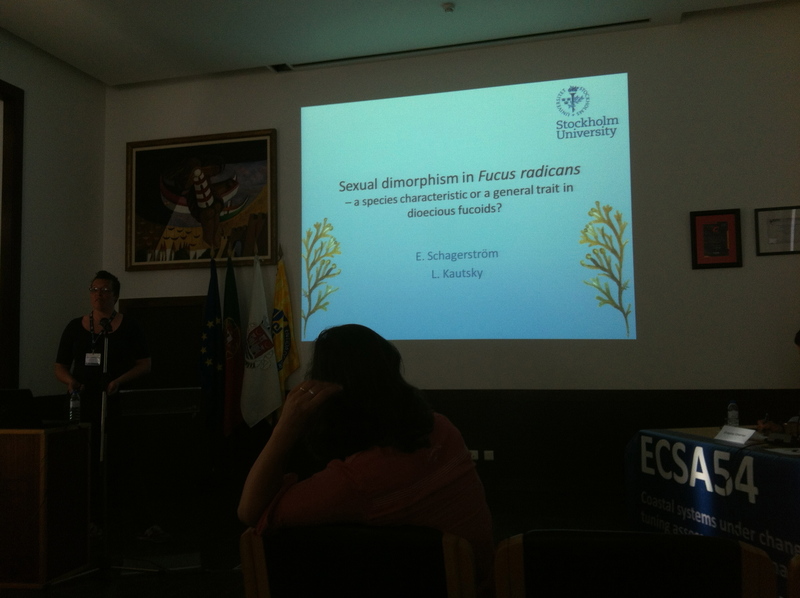 After a sugarhyped coffeebreak it was time for yours truly to proclaim the wonders of Fucus radicans and its sexual dimorphism (more on this over a pint or in the upcoming thesis). The magic World of Fucus radicans! 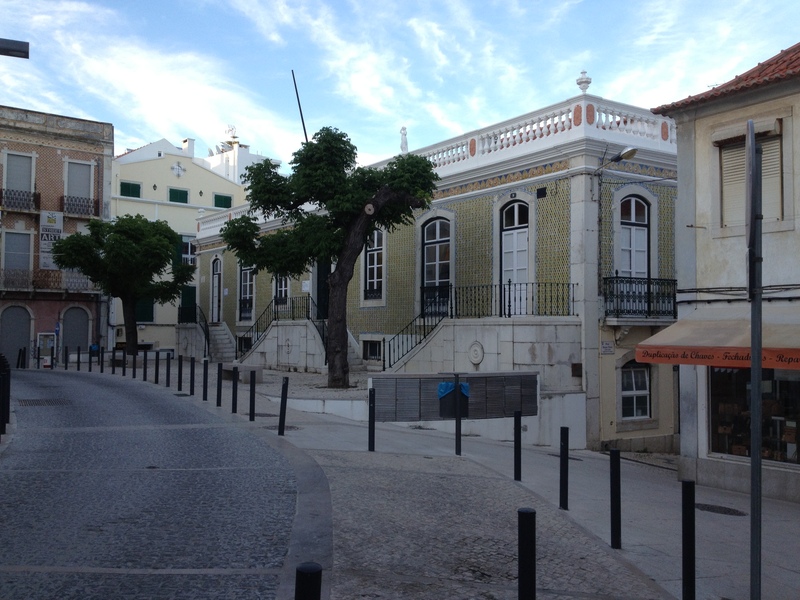 After ten minutes of presentation and a couple of good questions, we moved on about 50 meters down the road to the postersession, that was held in a Beautiful building with a tiled exterior, typical of Portugal. Cacophony is a rarely used word, but it describes well what erupted. 200 scientists in a small room with beer, wine fruit juice and tapas, and 60 posters that everyone want to read and discuss. Scientific mingle at its very best. 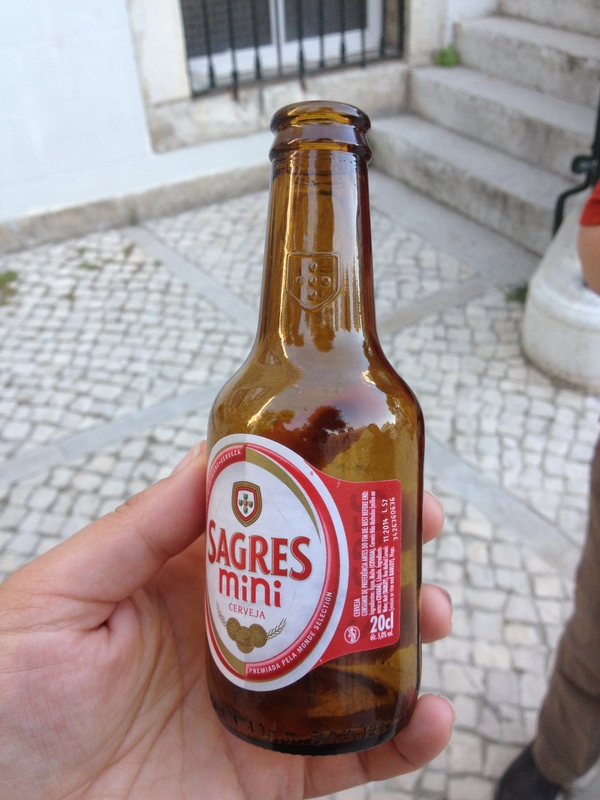 Worth noting is that beer in Portugal comes in 20 cl bottles. That’s called a mouthful in other countries. After mingling and chatting for well over two hours, we are now back at the hotel for a short rest Before dinner. Yesterday was the Day of Molluscs, today it will be Crustaceans. Waking up to the noise of the rolling waves of the Atlantic meeting the shore of Sesimbra bay is not a bad way to start a Monday. 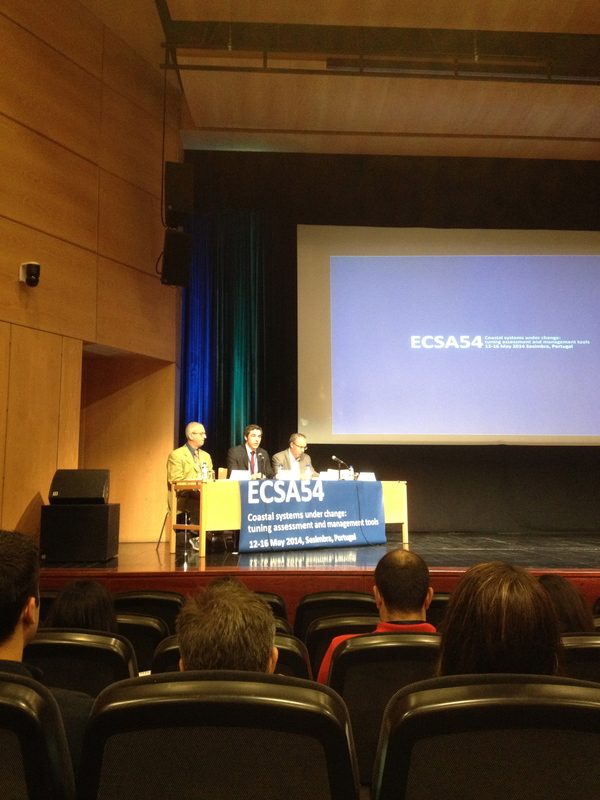 This week, the BalticSeaWeed blog attends the ECSA54 conference in the lovely seaside town of Sesimbra, on the southern coast of Portugal. 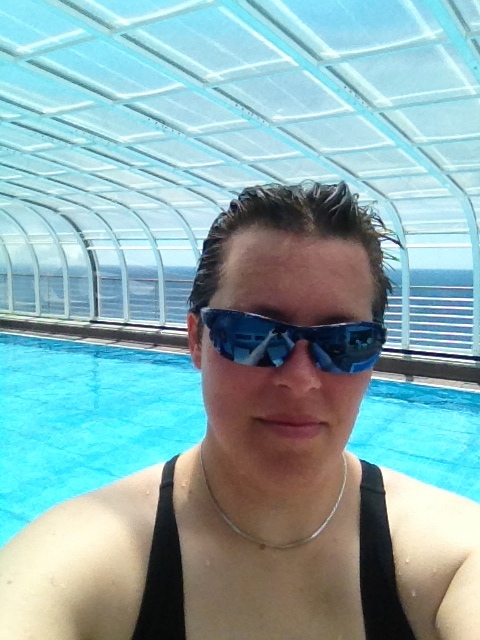 What a wonderful venue for a marine conference, indeed. Even though we spend most of the time indoors, it’s still nice to know that outdoors there is a sunny 20 degrees C waiting for you. ECSA stands for Estuarine and Coastal Science Association, and is closely linked to the Elsevier scientific journal Estuarine, Coastal & Shelf Science, which publishes the papers from the conference in a special issue each year. We start the conference by the mandatory opening session with information, thanks to the sponsors, organizers and welcome by the Sesimbra mayor. There are 250 participants from more than 40 countries, which is a really good scope. The first topic for the conference today is “Shifts in biodiversity and ecosystem functioning” which is opened by keynote speaker Anne Magurran from St Andrews University, Scotland. 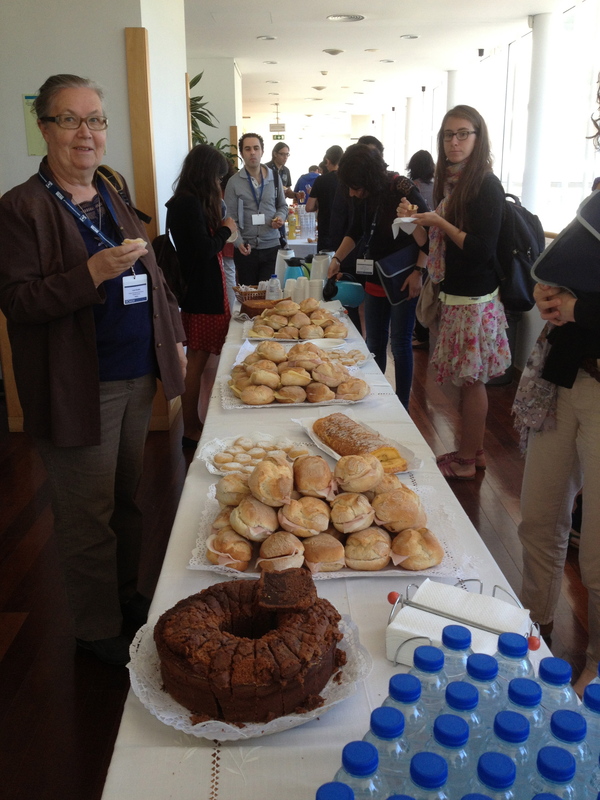 We are happy to see that of the invited speakers, there are more women than men. A first for me, hoping this positive trend will last. Anne takes us from Darwin and his observations of species richness and abundance and explains how ecological communities’ richness changes over time. She uses a data set from the Bristol Channel as an example, where scientists have sampled fish in the water intake mesh to a power station every month for 33 years! What a data set! (If you want to read some nice fish papers, look for Magurran & Hendersson 2003 Nature, 2011 Phil. Trans. or 2012 PRSB, and Shimadxu et al 2013 BMC Biology). This data set really provides good background for community modelling, which will come up in the program several times during the week. I will be interesting to see if anyone has as good a background data as this. After showing the natural changes in the system, Anne moves on to speculate on how much chance is caused by human impact. She concludes that the consequences for ecosystem functioning is yet to be understood, and this should be a future area of research. After this very inspiring talk, we move on to three fish presentations. First out is Felipe Martinho from Portugal, presenting “How well do fish community-based measures of ecological quality track change over time? The role of anthropogenic vs climate-driven pressures.” He and his research group have made an Anthropogenic Pressure Index (API) and tested it on local data from 2003 an forward. He presents a decreasing trend in anthropogenic pressure for their estuary, which is nice to see for a change, also that 2006 was a dip in diversity. It would be very interesting to see if this dip can be seen at a larger scale. He ends by pointing out the need for data, and to point out that some pressures will not be measured if they do not significantly affect the biota due to, for example, too low levels. Prabath Jayasinghe from University of Cadiz, Spain, presents “Links between descriptors of good environmental status (GEnS): Commercial fisheries and marine biodiversity”. The goal of the European Marine Framework Directive is to maintain a good environmental status through high biodiversity. So, what are the pressures from commercial species fisheries on marine biodiversity? This is actually not very well known. Dismantling all the different factors used by the DPSIR Framework to analyze the impact of commercial fishing, and where their data comes from, we see that there are gaps, and quite large ones, too. Some of the major points are the impacts of bottom dredging and trawling, which destroys so much more than just what they are after, the destruction of macrophytes, which are important nurseries, and several depressing numbers (and photos) on the amount of turtles (60. 000 die each year in ghost nets in the Mediterranean Sea alone), sharks and sea birds that fall victim to long lines, nets and other plastic debris. We need to define which pressures we can do something about, and do it! 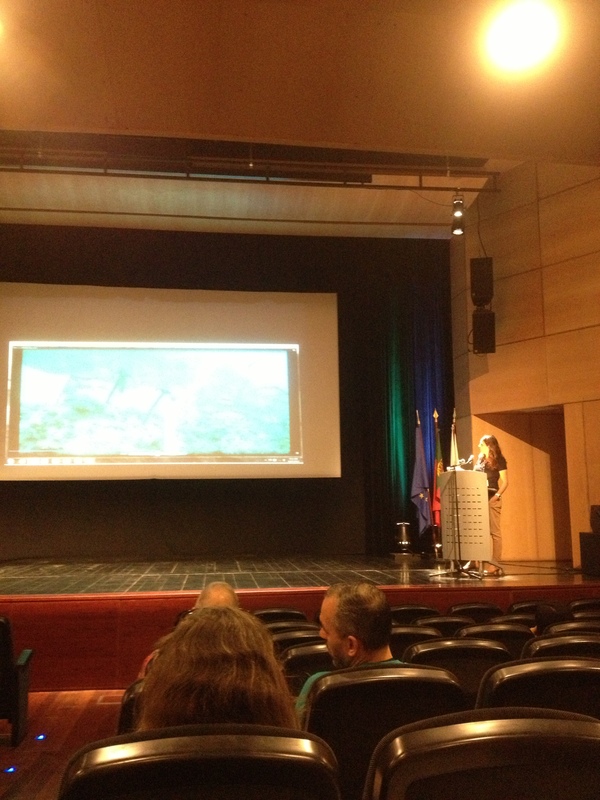 Last out before coffee is Rita Vascaconselos from Portugal, presenting her work on “Worldwide patterns of fish species richness in estuaries: Investigating the effects of spatial scale”. Estuarine environments have less species than the adjacent marine environments, and have the gradient from freshwater to marine waters (ecotone/ecocline). 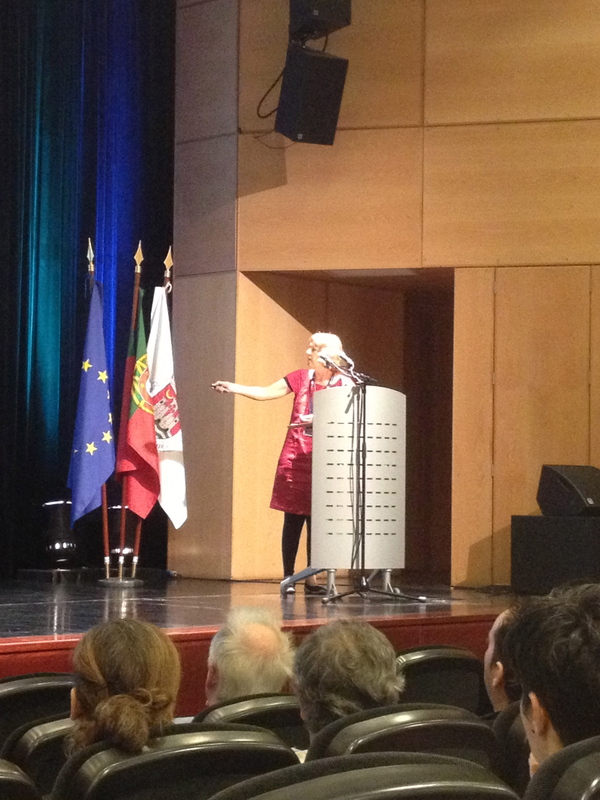 Rita has compared data from 130 estuaries around the world, based on ecological realm (salinity) within the estuary, between continents, water temperature and precipitation (which is a factor that has a much larger impact on estuaries than marine environments and must not be forgotten). The take home message is the overwhelming importance of considering different spatial scales and biogeography to quantify important predictor variables. After discovering that coffee in Portugal means lunch (with meat pies and sweet cakes) and the coffee is made cup by cup by a barrista (oh joy), we trotted down the narrow sunny street to the smaller venue for next session. Nice and sugary! But where is the coffee? 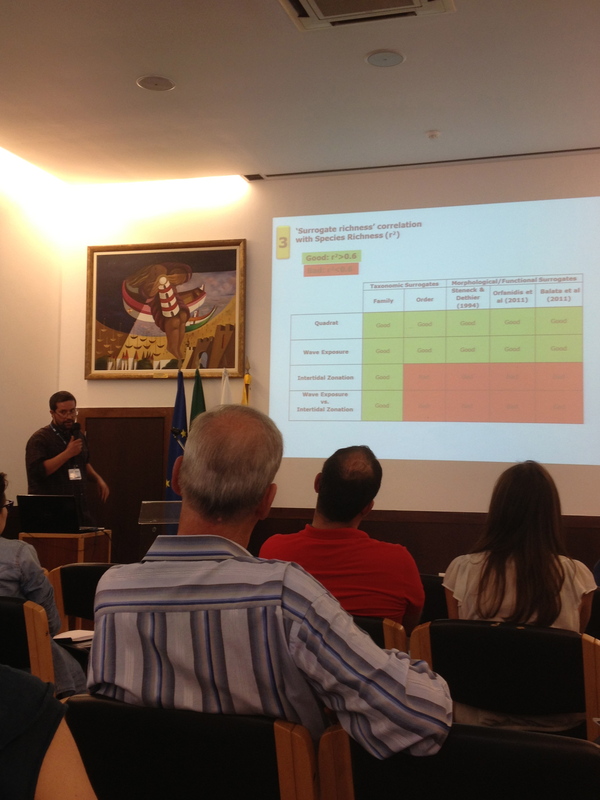 JN Franco showed how the kelp Laminaria ochroleuca has decreased in distribution and abundance along the Portuguese coast, and presented his research on the top down (grazing) and bottom up (nutrients) effects that might cause this. Also, the effect of high temperature on growth was tested. Copper in the sea is both of man made and natural origin, but is toxic in the ppb (parts per billion) for some organisms. E Davarpanah have tested if the micro plastic particles that are littering the oceans, in any way change the toxicity of copper on marine organisms. The results show that micro plastics are having large effects on whole ecosystems, and although the tested concentrations were low, there are toxicological interactions. Rui Gaspar finishes the kelp session with “The use of biodiversity surrogates to describe intertidal macroalgae patterns at small spatial and temporal scales”. The idea is to reduce costs and the need for taxonomic expertise in species rich surveys, previously elaborated upon by Steneck and Dethier 1994, Orfanidis et al 2011, Balata et al 2011 and Smale 2010, and find surrogates that are more easily monitored. Surveys were made, using 50×50 grids on transects through gradients. Each grid was photographed and fed into GIS to get % cover and mean cover per species. Comparing this model to previous ones, this one seems to have a much better resolution as a taxonomic surrogate for family, but not order, and the is not as effective as the model by Seneck and Dethier, so, all in all, maybe one should focus less on time-is-money and just get down and do the work? With more than 2 hours until next session, and not really hungry for lunch, there was only one thing to do.